I've often wondered how my grandfather ended up settling with his family on the South Dakota plains right in the middle of the Cheyenne River Sioux Reservation. While it is impossible to know what was going on in the minds of people who are now long dead, I suspect that the Crowleys may not have dwelt much on the fact that the land they bought in Ziebach County shortly after the turn of the last century was considered by anyone to be part of a reservation. This is not to say that the Crowleys were not aware of the Native Americans who were in their vicinity. Family lore has it that when the Crowleys were moving to Ziebach County, they passed through the Standing Rock Reservation on the way down from North Dakota, where they spent the night at the Standing Rock Agency. Apparently, they spent the night in a building at the Agency with a number of the local Sioux. My grandmother is reported to have stayed up the entire night, unable to sleep, because she was terrified of the Indians. When I was little, I remember my grandmother telling stories about running off the “thieving Indians,” as she put it—who came to the door looking for food, or perhaps to buy or sell something. She was proud of her ability to brandish a rifle at these times. Still, she was not entirely without more tender feelings for some of the Native Americans. My father reports that the family took in a young Native American lad, Tony Roach, for some months to make sure that he was fed and sheltered while his family was away. Again, however, the Crowleys were unlikely to have thought much about the fact that they were living on a reservation. When Congress passed a law in May 1908 opening up “surplus” lands on the Cheyenne River Sioux Reservation for homesteaders, many people—including the white settlers—felt that these lands had been carved out of reservation and were now, in essence, "former" reservation lands. In addition to making available millions of acres for homesteading, Congress made allotments available for town sites, schools, and other accoutrements of American society. In fact, the sale of a portion of the reservation lands accompanied action to make individual land allotments available to each tribal member. Many people felt that opening up Indian country to homesteaders and giving each Native American a piece of land would speed up the assimilation process. Eventually, it was thought, the reservation system would fade away, becoming a dim memory as homesteaders and Indians alike became part of the larger American “civilized” society. While the tribes fought the breakup of their reservation lands in the Federal courts, most homesteaders did not spend much time thinking about living on a reservation. They lived on private land—not reservation-controlled property, which they variously bought or leased. They lived in Ziebach County, which had governmental offices seated in the town of Dupree. Most homesteaders would not have had any reason to have any dealings with the tribal authorities. If they had crime problems, they would have turned to the sheriff in Dupree, rather than interacting with reservation law enforcement. My relatives never mentioned that they had lived on a reservation—I only discovered the fact a few years ago. The sale of reservation lands to homesteaders created a series of complicated legal issues that were still being sorted out in the Federal courts in recent times. It was only with a Supreme Court ruling in February 1984, that the legal question of Cheyenne River Sioux Reservation boundaries was finally put to rest when the Court ruled that the sale of lands had not “diminished” the reservation. Therefore, land in non-tribal hands stemming from the land sales in 1908 was indeed still on the reservation. Unfortunately, the courts have not sorted out all of the legal issues resulting from the 1908 Act to everyone's satisfaction. Tribal and non-tribal members living on the reservation today face a complicated set of legal jurisdictions in which the tribal government has some jurisdiction over some issues and the non-tribal county government has jurisdiction over others. For example, who does one call today when a crime is committed? The tribal police? The County Sheriff? The South Dakota Highway Patrol? The FBI? The answer—it depends on such things as whether the offender is a tribal member or not, whether the crime was committed on tribal-controlled or private (non-tribal) property, and a variety of other factors. And, in day to day practice, it is a lot more complicated to sort this out than it would be off the reservation. Today, many believe that the result is a crazy patch-work set of jurisdictions. And, the Lakota chafe at the limited ability they have to manage affairs within the limits of their own reservation. 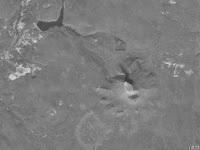 This is a satellite photo of Thunder Butte taken by a U.S. Geological Survey satellite on October 18, 1996. There is a small dam with water backed up behind it northwest of the butte. The dam and water were not present during the 1920s and 1930s, when the Crowleys homesteaded near the butte. In fact, the 1930s were very dry years, and it was difficult for many people to make a living in the western plains of South Dakota. Many people who had settled in this country when Cheyenne River Sioux tribal lands were opened up to homesteaders subsequently left for "greener" pastures.